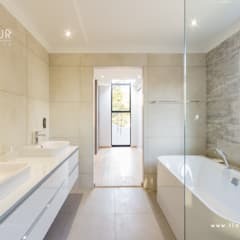 The style of bathroom that you choose will depend not only on the size of the room you have to work with, but also on the colours, tones and themes that appeal to you personally. Generally speaking, there are six styles (we take a closer look at these below) that we recommend choosing from, however there is also the possibility of mixing and matching to create the ultimate space that reflects your personal taste to a tee. 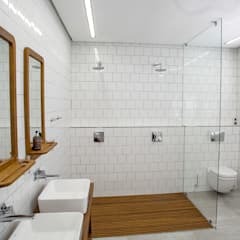 The broad categories are modern, classic, eclectic, Scandinavian, rustic and country and with homify you can find countless examples in each category, to help you get a better idea of the styles that you actually like and how you might implement them into your own bathroom. 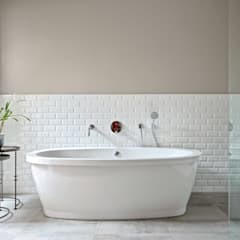 Each style has key features that make it unique or noteworthy, Scandinavian bathrooms are, for example, defined by use of light wood tones and white finishes, while a rustic look will likely feature exposed brick or darker wood. The style that you choose doesn’t necessarily have to reflect the theme of the rest of your home and as many of us have a penchant for various approaches, it can be fun to mix-and-match from room to room. 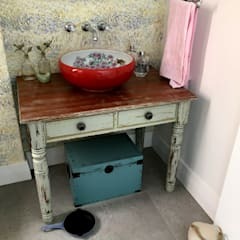 A country style kitchen and a classic-look bathroom? Why not! An eclectic approach overall can give a home more energy, but sticking to one theme is also no problem if you have a clean and clear goal. 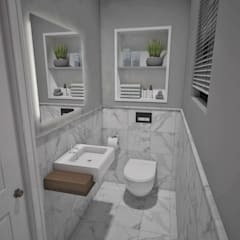 Can I renovate my bathroom myself? 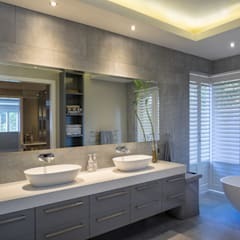 Whether or not you can renovate your bathroom yourself depends on the specific renovation or improvement that will be taking place. If it’s relatively simple and you’re not a DIY newbie, then it’s completely possible to be able to undertake the task yourself. 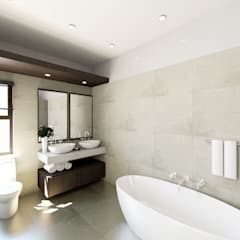 If, however, plumbing or moving of installed pieces like the sink, bathtub, shower or toilet are necessary, then you’ll almost always need to call for professional help. Essentially, if there’s water or wiring involved—steer clear. Finding a professional can also give you a fresh perspective on any design choices and confirm what is or is not possible, so we always encourage it. If you’re looking for some DIY projects that you can easily do yourself, homify has plenty of options and guides to help you. Things like building shelves, installing a mirror, re-decorating, painting and tiling are all improvements that you can likely manage yourself—as long as you have the right materials, tools and plan. 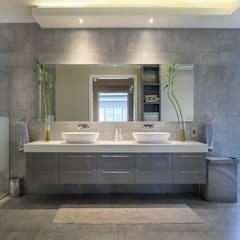 What are some practical bathroom design tips to keep in mind? Wiring: Ensure that you or your designers consider replacing any out-dated wiring with a dedicated circuit and plenty of outlets for all the appliances you use, from electric razors and toothbrushes to hair-straightening irons. Accessories: Think about how high you want to hang towel rails and hooks. Designers often have their own dimensions in mind so it can be a good idea to decide where to put things early on to ensure that the height is practical as well as aesthetically pleasing. We all know the pain of a mirror that’s hanging too high because a taller person installed it! Tiles: For a nonslip floor, many people go for small tiles with lots of grout lines, which offer better grip than large tiles. Another option, however, is tiles with textured surfaces, matte finishes, or sand-containing glazes. Try to avoid porous natural stone tiles like limestone and choose porcelain or glazed tiles if you want a low maintenance floor. To keep longevity in mind, ensure they are well sealed or they'll absorb water and become stained over long periods of time. 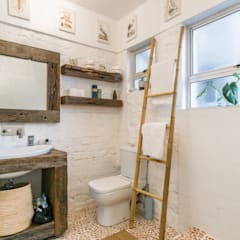 Niches for Toiletries: One way to create an impact in a small bathroom is to take advantage of wall cavities and build storage into the existing wall spaces, nooks and crannies. 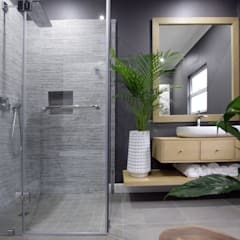 Shower shelves and organizers can look cluttered and untidy but something like a recessed cubby in a shower wall doesn’t take up too much space and gives shampoos and conditioners a permanent, and far more refined, home. Which material should I choose for the walls and floors? 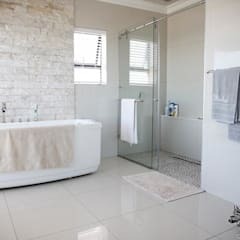 Although many of us only think of tiling when it comes to choosing bathroom flooring, there are many other materials on the market that can be just as effective. Take a look at porcelain, vinyl, natural stone, engineered wood, laminate, solid hardwood and carpet (yes, carpet!) and determine which style appeals to you the most. Once you’ve determined what you want, you can investigate whether it’s possible in your bathroom and whether or not it will truly look good. Sometimes it’s also a question of maintenance as some materials need to be cleaned more than others. 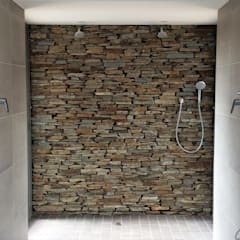 You should also ask yourself if you want a continuous tone or a mosaic of colours, if you want large pieces with grout lines or one, single slab. What you ultimately decide might also be directly related to the style you’re going for. 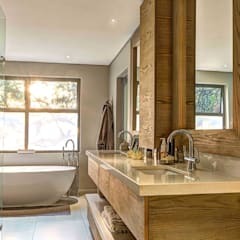 Rustic bathrooms for example, are more associated with wood but modern or minimalist bathrooms have sleeker, white finishes. What kind of accessories are used in bathrooms? 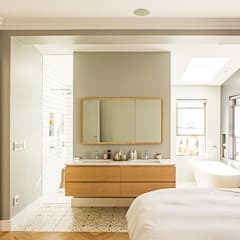 At the end of the day, accessories are the make or break elements in just about any room—and that includes the bathroom. 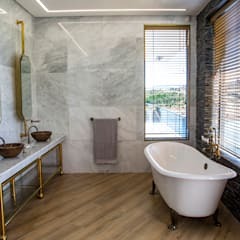 As the bathroom is a practical space, there are essentially two types of accessories to adorn the space with; the functional, including mirrors and towels, or the purely decorative such as bowls, candles and stones. 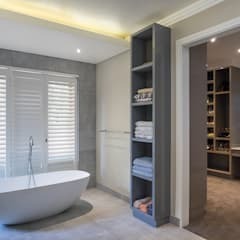 The two categories can easily complement one another and work in unison, but remember that functionality is ultimately the most important thing, so if you’re strapped for space, choose your towels and mirrors first. Which lighting options should I consider? 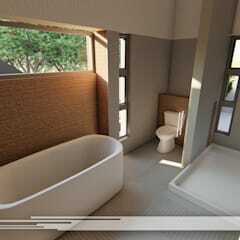 When designing a bathroom it is imperative to think about lighting, but also rather difficult. What points should be illuminated? Where exactly should lights be installed? A poorly lit space will be uncomfortable and dysfunctional, which is the opposite of what we’re going for. 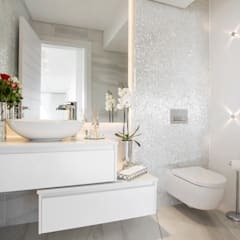 If you’ve got a vanity with a mirror, you’ll find the the right lighting here is essential, particularly if this is the space where you intend to do makeup or any other kind of health/beauty routine. If the bath or shower is separated by an opaque curtain, you should also consider placing another spot of light here to ensure visibility. The lighting choices in the rest of the room will depend on size and height, as well as the exact effect you’re looking for. 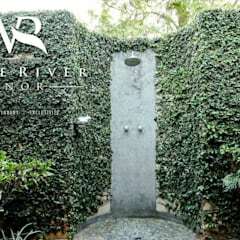 What are the most popular bathroom styles? Eclectic: These rooms combine colors, textures, prints and finishes that inspire our imagination. Minimalist: Minimalism is characterised by straight lines, muted colour palettes and simplicity. 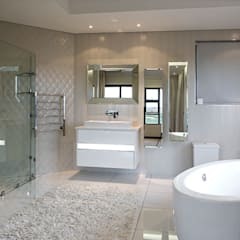 Modern: Bathrooms adhering to modern style can be colourful, muted or the perfect line between the two. Following the latest trends and keeping it clean is the name of the game here. 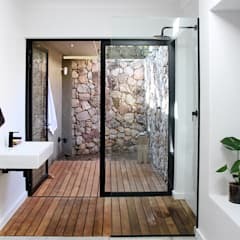 Country: Whether country or rustic, bathrooms with these looks are always warm and welcoming, with a touch of elegance in the details that create a finish of undeniable appeal. Scandinavian: Fashionable and filled with potential, Scandinavian-style effortlessly finds the line between rustic and minimal, combining a chic, modern feeling with a sense of nature and feng shui.